Put around 200g of dry ice in a small plastic bowl and place in your sink with the plug in. Do not add water. Wait 10 minutes at which point your sink will be full with invisible carbon dioxide gas, the stuff that makes drinks fizzy. 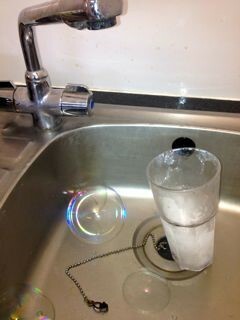 Ask your children to blow bubbles into the sink - they will float in a most unexpected way! When finished pour dry ice back into the storage box and pull the plug out of the sink.